This story is a reprint from Miata.net. It is my friend Jim's story of his trip last summer. I packed some clothes in a a gym bag, gave my 1992 Miata a good waxing and pointed it west on Route 66 for an adventure from Kansas City to the Santa Monica pier and back again. The only constraint for this trip was that there was a two week round trip time frame. Other than that, there was no specific destination, no itinerary and no expectations other than to keep the four wheels on Old Route 66 as much as that is even possible. My companion and copilot was my best friend from high school 40 years earlier. He from Arkansas and me from Kansas. We met up and entered Route 66 in Joplin, MO. First let me tell you a bit about the Miata. I'm the original owner. She's been a daily driver only to wander no more than a handful of times. She's never been more than about 300 miles from home. I had 110,000 miles on the car but had no real concerns about whether or not she'll make it. With a new radiator, new tires and a fresh battery...what possibly could go wrong? I had more concerns about how comfortable we'd be with driving up to 10 hours a day. I'm happy to report that we logged 4,010 miles and the Miata performed flawlessly. And with pit stops and sites to see every hour or so, we never did feel cramped. She dodged the broken pavement of New Mexico and Arizona. She outran a thunderstorm in Oklahoma. She busted thru a dirt devil in Texas, and kept up with the freeways of L.A. Like a trooper. But the most memorable moment of the trip was falling in line with a caravan of 11 Corvettes in western Arizona on their way to a car show. Eleven Corvettes and a lone Miata chasing each other slightly over the speed limit. We had met them earlier in the day in a museum parking lot. I parked along side of them and jokingly told some of the members, "Shhhh, don't tell my car, but it thinks it's a Corvette." This gave them a laugh. We all proceeded on our way and we wished them a nice day, but a few hours later we saw them again up ahead of us way out in the middle of nowhere Arizona. I gave them a friendly honk and fell in line to enjoy chasing them at speeds....well, who's remembering the details! 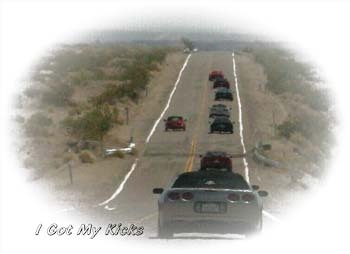 I could feel my Miata grinning from headlight to headlight as we continued to pester them from the rear of the pack, as we kept up with them quite nicely. After about 10 minutes of this chasing I told my buddy that I had an overwhelming urge to pass them one by one -- which is exactly what I did. Swoosh-Swoosh, Zoom-Zoom (x 11) and I achieved my goal. I grinned my widest grin and we laughed our heads off. I for sure found my kicks on Route 66! 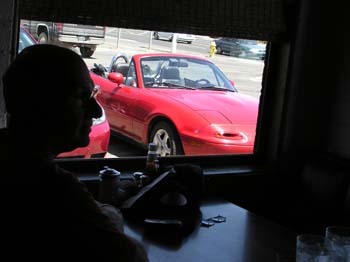 Later that day we saw them all parked at a diner, so we pulled in and met them once again, and we all had a good laugh. The lead driver told me, "You know at any time we could have taken your fun away from you." "Yah" I said, "but you didn't, and I thank you for that." This was the little red Miata that thought it could and then did it. They had nicknamed her the little red skateboard. We exchanged email addresses and they (to my surprise) sent me this picture that captured the moment of passing the first seven on the way to the 11th. 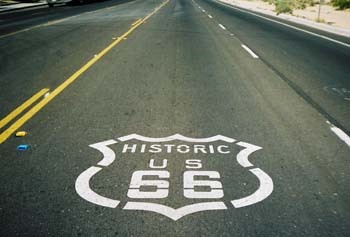 In addition to not veering off of Route 66, we added two more rules as we discovered the real heart of the Mother Road. First, we would never eat at chain restaurants. Second, we would only stay at the authentic 50's motels along the way. It is really refreshing to find the past is still alive...at least for the time being along this route. Now that I've been home for a few days and will shortly go back to work, she still is sleeping peacefully in the garage. Strange, but has anyone else ever noticed that Miatas can smile in their sleep while apparently dreaming? Having just come off my own 4K plus road trip, some of it spent ogling old stuff along route 66, maybe my daughter and I should have taken your approach. Instead, our rule of thumb was stick to the interstate and only stay in chains hotels. Guess we're a little uptight.